Unified Police Department Officer Douglas Barney II was shot and killed January 17, 2016, while investigating a traffic crash near 2160 East 4500 South. Witnesses told officers that a man and a woman had gotten out of one of the vehicles and fled on foot. While searching for them Officer Barney encountered the male suspect in a neighborhood a few blocks away. The 31-year-old male suspect fired one round at Officer Barney, striking him in the head and killing him instantly. When the suspect was located by other officers a few moments later, he opened fire on them. Officer John Richey was shot through both legs but later recovered. The suspect was shot and killed. An 18-year veteran of law enforcement, Officer Barney leaves a widow and three children. 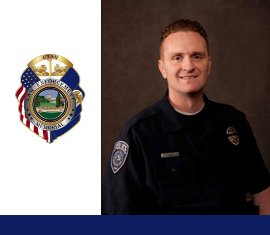 We will be honoring Officer Barney and other Utah victims of gun violence with a Vigil to End Gun Violence on Sunday, December 11 from 7-8 pm at All Saints Episcopal Church in Salt Lake City. Families are welcome to attend. We may not always have the chance to honor and remember those who serve the way we want to, but my family is honored to be able to leave flowers at Officer Barney’s grave today. For his mother, who couldn’t be here, and for the families of all who give their lives in service to others. May God bless you and watch over you.